One of the best defenses against blemishes and breakouts is consistently clean skin. 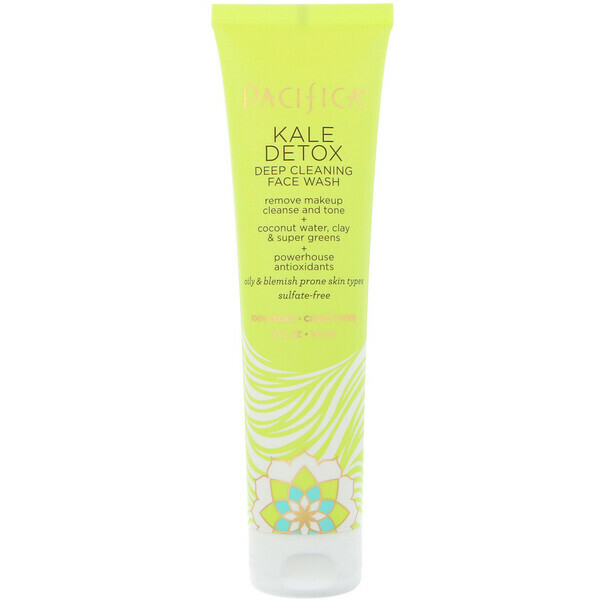 Fortified with super green phytonutrients including kale, seaweed and blue seakale along with tropical extracts of mangosteen and coconut water, this formula is designed to cleanse and remove makeup, toxins and impurities from the skin both day & night. Every true beauty know it's what's on the inside that matters. Formulated without SLS, sulfates, parabens & petroleum. Created with women, animals & the planet in mind. Aqua, cocamindopropyl betaine (coconut source), sodium c14-16 olefin sulfonate, aloe barbadensis leaf juice, (coconut source), glycerin (vegetable), sodium cocoyl glutamate (coconut source), decyl glucoside (corn source), sodium pca, citric acid, panthenol (vitamin B), citrus medica limonum (lemon) peel extract, allantoin, magnesium ascorbyl phoshate, cocos nucifera (coconut) water, brassica oleracea acephala leaf (kale) extract, potassium sorbate, ethylhexylglycerin, sodium benzoate, crambe maritima leaf (blue seakale) extract, garcinia mangostana (mangosteen) extract chamomile recutita (matricaria) flower extract, camellia sinensis (white tea) extract, arnica montana flower extract, kaolin, parfum (natural), chlorophyllinum cupreum (chlorophyll).